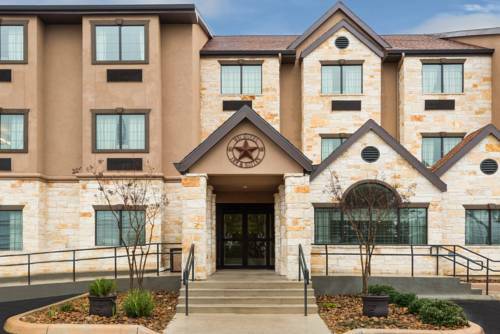 Enjoy a refreshing experience at this Microtel Inn and Suites San Antonio by SeaWorld hotel located in the heart of tranquil Hill Country on the Loop 1604 corridor. Feed dolphins and experience thrilling rides at SeaWorld San Antonio, Lackland Air Force Base, and the River Walk with restaurants, museums and entertainment are minutes away. If you enjoy history, relive the world-famous Alamo only 18 miles from the hotel. Ideal for business and leisure, relax at this newly built hotel with modern conveniences including wireless Internet access, complimentary parking, outdoor pool, guest laundry facilities, copy, fax and printer services. Recharge each morning with the continental breakfast, and energize at the fitness center. Relax as the kids play in the children's play area, and enjoy grilling burgers in the BBQ area. Guest room amenities include 36 inch HDTV. Suites, smoke-free and handicapped-accessible rooms are also available. ~60 miles from San Antonio.